On top of the Ken Clarke extravaganza, who is given a free ride on the BBC Radio 4 Today Programme for nearly twelve minutes, we are seeing evidence of the corporate scare machine cranking up into high gear, in what appears to be an attempt to head off an EU referendum altogether. Mostly, they are not even attempting to arguing the case for remaining in the EU (mostly, one assumes, because the case is so poor). Rather, they are attacking the very idea of having a referendum. The corporates – in their own minds – are supreme, and the thought of us little plebs being allowed a vote fills them with terror. Thus we have the parasites PwC spreading their anti-democratic poison in the corporate ragMoneyMarketing. 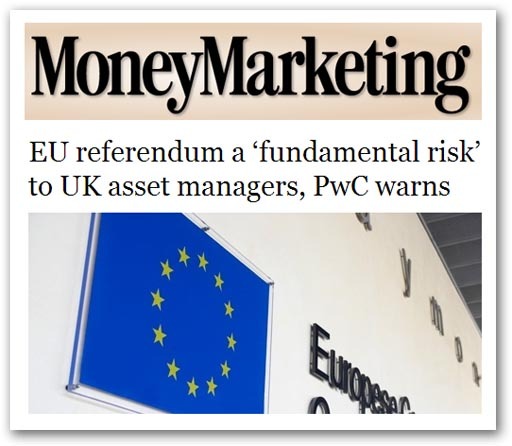 Parasite-in-chief, PwC hedge fund leader Rob Mellor, is allowed to bleat: "A UK asset management industry outside of Europe may face obstacles to the continued management of assets for EU-based investors. This is a fundamental risk to the growth of the industry". In any free and fair discussion, you would not give this sort of jobsworth bleating more than a short blast of contempt, so lame and dismal is the argument. But the corporate might of PwC gives it open access to the ranks of the brain-dead. 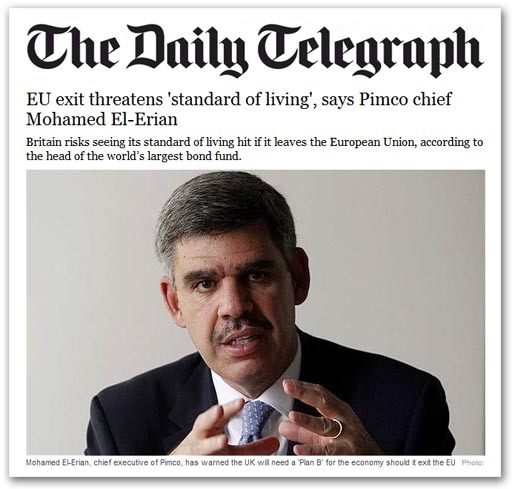 Similarly, we get the vipers' nest of europhila – the London School of Economic - stir up its zombies in the LSE "Growth Commission" to warn us of the terrors to come if we threaten their gravy train. The idea of leaving the EU would be very, very damaging for the UK, so I personally think the uncertainty around having the referendum is actually going to retard growth and retard investment, so I don't think there is a strong case for having that referendum. What we are not told, however, is that Van Reenen has been an Executive Committee Member of the Fabian Society since 2006. One has to note, though, the strap line which conveys the same anti-democratic sentiments held by PwC: "The Government just talking about an EU referendum is damaging investment and productivity, influential economists warn", it says. There, naked in tooth and claw, is the corporate mind exposed. We shall stay in "Europe" and you shall not even think about leaving it, much less be allowed to discuss it. Any idea of democracy and public consent does not even enter their foetid, closeted minds. We the plebs must not dare to question our masters, nor be allowed to debate their folly and their greed. What last vestiges of democracy we ever had are draining away into the sand. With our very necessary focus on European Union issues, it is easy to lose sight of other events, no matter how important they are. That is the fate of the specialist, but it is one which must be guarded against. What we might treat as "noises off" can well have a significant effect on our obsession, the EU referendum. One such was Tuesday's vote on constituency boundaries, and the reduction of the number of MPs from 650 to 600. The combined effect of that – in throwing out the proposed measures – was to make the election of Labour that much more certain, giving Miliband a built-in cushion of 20 seats before the first leaflet has been dropped through letter boxes. No one will disagree on this that the electoral system has now been skewed. With the shenanigans over postal votes – in a system that is also crying out for reform – the British electoral system is acquiring more than a few of the characteristics of a banana republic, ensuring that the next election will be anything but fair and free. I felt no longer as though I was in noble Westminster, "mother" to so many other democratic assemblies. I am sorry to say it felt more like being at a third world parliament, the plaything of one of those former Soviet states run by thick-necked ex-Communist thugs. In Britain, he goes on, "we have long flattered ourselves that we play by the rules. In the Commons on Tuesday, the rules were blatantly broken. In the 23 years, on and off, I have been reporting Parliament, I have not felt so disgusted by our political class". Letts is quite clearly outraged: "The behaviour of Mr Miliband, Mr Clegg and their MPs is worse than cash-for-questions or the expenses scandal", he adds "Those were fuelled by small-minded greed. This is the naked abuse of parliamentary principle. This, I am afraid, is anti-democratic theft". 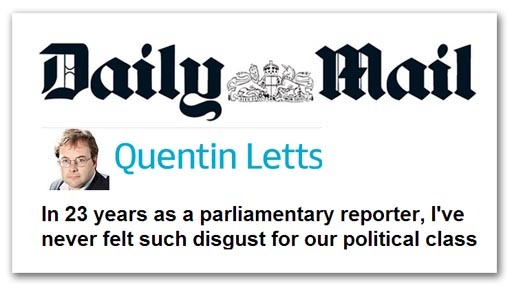 Sadly we could say the same thing of the insistence of our political class over our membership of the European Union, and yesterday's debate on "Europe" was in its own way just as offensive as the to event to which Letts takes such exception. There, you had MPs indulging themselves in a fatuous, ill-informed debate, not in the least reflecting the concerns of the people who elected them, rehearsing the same tired-old mantras. The debate was an insult to the very concept of democratic principles, without passion or fire. Lazy, disinterested MPs going through a sham ritual of debate without the first attempt to engage in the issues and get themselves properly informed. What Letts reports of the Tuesday vote, however, is the lack of outrage inside and outside the House to what in fact is blatant cheating. Similarly, we see a lack of response to the lacklustre performance of our MPs yesterday. But what was there to react to? It was a debate hardly worth reporting (and many newspapers haven't bothered). Unfortunately, the two issues are conjoined. Kate Hoey in the debate yesterday felt certain that Miliband would soon fall into line and before the general election commit to an EU referendum. But, if the Labour leader feels he can win the election on the basis of rigged constituency boundaries, he will most certainly be less inclined to give us a vote on the EU. If he cheats us, though, the pressure will not go away, and nor will the contempt. The British population may be slow to anger, and very slow to realise what is going on, but it is getting so bad that even Iain Dale has noticed something amiss. When the chattering classes fall out of love with politics, one suspects that the centre cannot hold for that much longer. For months, if not years, there has been a clamour from those opposed to Europe, that has always been shrill and often effective. We are told that Europe is bad for the British economy, that being part of Europe means abandoning our allies in the USA, that Europe is obstinately against reform, dedicated to bloated bureaucracy rather than the needs of European citizens, that being in Europe means losing our identity as the British nation, that as a consequence, Britain should rule out joining the euro and should prepare to leave Europe altogether. Then said Mr Blair, "It is time we took each of these arguments in turn and demolished them". Playing the economic card, Blair said 3.5m jobs depended on British membership of the EU and that last year alone 50,000 jobs had been created because of inward investment as a consequence of European membership. He said Britain was stronger because it was in the EU, although he accepted the need for reform of the Brussels bureaucracy. 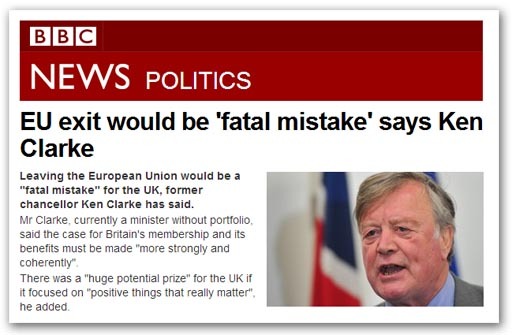 And sitting alongside the now former prime minister – nearly fourteen years ago - was Ken Clarke, the man who is now telling us that leaving the EU would be a "fatal mistake". Normally, people who are so consistently wrong become a laughing stock. But this does not apply to europhiles and the BBC. The FUD-factory is open house to predictions of doom. This, though, is the BBC report on the launch of British Influence yesterday. Of all the quotes they could have picked from Clarke's speech, this was the one. But then, they are nothing if not predictable, boringly so. After nearly fourteen years, Clarke still churns out the same old propaganda, the same mantras, the same tired old claims – and he is still talking about "reform". But the FUD makes the headline. Being the BBC, it seems, means never having to think up any new tactics. The thing that struck me about the Commons debate on "Europe" (the bit I could tolerate) was its flatness – the lack of knowledge, imagination or of anything new to say. Whatever debate there is, it isn't being driven by MPs, who really do have nothing to offer except the same old, derivative mantras. For that debate, you are going to have to go to the blogs that the MPs don't read, such asBoiling Frog who has put up Part I of a further exploration of Article 50, taking on board the two-year negotiating period, and the response of the "colleagues". By coincidence, we also see a piece from Helen Szamuely in International Business Times, also on Article 50, this one in relation to an exit strategy. There is more wisdom, information and knowledge in these two pieces – both of them worth studying and keeping - than you will find in the hours of speeches from the ranks of dismal MPs who spoke today. None of these have spent any time learning the history of the EU, nor the dynamics of the Community. The shallowness and the misinformation from people who would lecture us on what we should do is, frankly, offensive. Therein lies much of our problem, especially with the likes of John Denham and Paul Blomfield who are so free with the insult "europhobe", men who complain of resentment towards the European Union, while speaking glibly of peace in Europe through their insults. These MPs in particular are a disgrace, but there is not one I would give time to, from the pompous Ben Gummer to the well-meaning but naïve Andrea Leadsom and the insolent Emma Reynolds. None have taken the trouble to keep themselves properly informed. They have nothing to tell us. Bizarrely though, information in this country is not at a premium. The ignorance of the "ordinary man" – even those who claim to be educated – is largely self-inflicted. It matches that of the MPs who claim to represent us. The information is there to be had, not least through the modern miracle of the internet and search engines, but it doesn't get to them. In fact, it is through that miracle that we can watch our MPs in action live. With a slight tweak in technology, two screens can be fitted to one computer – as I have done, which allows me to watch the ghastly proceedings on one, while working on a document on the other. Unfortunately, the technology does not bring the quality automatically. That, one has to search out, and too few people are doing that – especially MPs and their assistants and advisors. They should not be surprised, therefore, if they are progressively left out of the real debate. Worthless prattlers, they really are a waste of space and time. The dregs in the Telegraph and then the BBC, continuing the work of the "colleagues". As a propaganda exercise, slagging off the EU in general and the European Parliament (EP) in particular, Andrew Gilligan's piece in the Sunday Telegraph this week got some favourable reviews, not least from Autonomous Mind. The proceedings in the EP are condemned by AM as "an appalling abuse of our money", coloured by Gilligan's description of the manner in which the agriculture committee last week "passed" reform provisions for the CAP, together with the substance, which was "even worse". All seven tiers of seats in the giant meeting room were rammed with people, and the sun poured in through big windows at the back. Rows of lobbyists in the spectator section ticked off decisions worth billions as Paolo de Castro, chairman of the European Parliament's agriculture committee, read out the votes as if he were a bingo caller, two or three a minute. "Amendment 510, those in favour, those against, abstentions, carried", said Mr de Castro, in Italian, without pausing or even looking up. (That amendment alone was something which could cost British taxpayers up to £45million). "Amendment 511, those in favour, those against, abstentions, carried. Amendment 512 … er, sorry, we forgot to vote on 485 — it's recital 83, amendment 485, we missed it out". Urgent, multilingual cries of "What? What? Where is it?" arose from the MEPs as they rifled desperately through their instructions to learn whether they should lower or raise their hands. "Anyway, we can control later, it is better to make a vote", Mr de Castro said. "Those in favour? Rejected? Oh no, carried, better check". This, according to Gilligan is "democracy Brussels-style", evoking feelings of despair as he told us that the agriculture committee, almost entirely unnoticed in Britain, "was voting to worsen the deal we've already got". "Over two marathon days", he wrote, "they laid down the future of perhaps the most unpopular policy in Europe, a policy that costs each British taxpayer roughly £180 a year: the Common Agricultural Policy". As anti-EU propaganda, this is good stuff – on the face of it. But it is also a travesty, distorted, erroneous reporting that betrays the writer's almost total ignorance of European Parliament procedure and of the significance of what he saw. As a record of what passed, his report is about as useful as would be one of mine on the current Test Match series. One of the key procedural points is that the committee didn't decide anything of substance. EP committees don't. What they had been doing (over many months, with laborious reports and equally laborious debates) is processing the thousands of amendments (over 8,000 of them) submitted in response to the Commission's proposals for CAP reform, whittling them down, rationalising them and assembling them into some sort of coherent order - all according to the Parliament's own rules of procedure. What Gilligan then saw and reported on was the final stage of this process, with a separate voting session to decide which of the amendments should go forward to the full, plenary session of the EP, whence each of those amendments will be voted on, for the Parliament then to arrive at its own "common position". This is a process that started formally on 12 October 2011 - more than a year ago - hen the Commission submitted a bundle of proposals to both the EP and the Council, triggering a complex and lengthy procedure. The proposals were referred to the agriculture committee on 25 October 2011 and, after seemingly endless debates, a draft report was produced on 30 May 2012. Amendments were then tabled in committed on five separate occasions from July 2012 through to December last, and it was on these amendments that the committee voted last week, in the procedure witnessed by Gilligan. Gilligan argues that this "shows up the EU's flawed democratic processes", claiming that "these hugely important changes have emerged almost entirely without public involvement, knowledge or debate. The amendments, and the compromises between them which were passed, were produced in private, and even published only a few days before last week's hearing". One must emphasise, however, that no decisions have been taken. No changes have been made. Furthermore, through the tortuous debates, the committee proceedings have been open, and televised proceedings are available to journalists on demand. That we have got to this stage "without public involvement, knowledge or debate" is simply because the legacy media can't be bothered to report it. At the plenary session – at a date yet to be announced – there will be a vote, but that doesn't decide anything either. 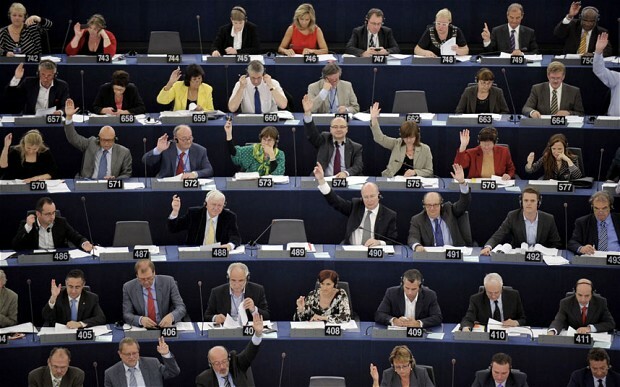 On the basis of the amendments accepted and rejected, it simply establishes the EP's "common position". Meanwhile, there have been no less than five separate debates in Council, which has also established its "common position". Once the EP plenary votes have been cast its common position drawn up, the laborious process of comparing the Council and EP positions must then be undertaken. The Council then has first bite at the cherry, debating which of the EP's amendments to accept, and which to reject, bringing out its own revised common position. Then, the EP committee has another go, analysing the Council position, making its recommendations to the full Parliament. There then follows another plenary vote, at which stage the aim is to bring the two positions into line. If, however, the EP cannot agree the Council position, the next stage kicks in – the "conciliation procedure" where negotiations are conducted between the Parliament and the Council – the so-called "trialogue", with a view to establishing that much sought-after joint common position. If agreement is not reached, the legislation falls. If there is an agreement, the result is put to the whole parliament for another vote - the "third reading". If the vote goes against, the legislation also falls. That, dear readers, is "democracy Brussels-style". One has to note, by contrast, that if this was British legislation, applying only to the UK, like as not it would be produced as a Statutory Instrument, debated perhaps once in a closed committee, and then passed without a vote, and without any facility for amendment, on the "negative assent" procedure. Where the democracy fails in the EU system, of course, is not primarily in procedural terms. The problem is that there is no demos to legitimise the policy, and the institutions are thus functioning without a democratic mandate (as indeed is our own government). What, most of all, you can't have, as Defra Secretary Owen Paterson told the Sunday Telegraph, only to have it omitted from its report, is a one-size-fits-all agriculture policy that stretches from the Finland on the Arctic circle to Greece on the fringes of Asia. 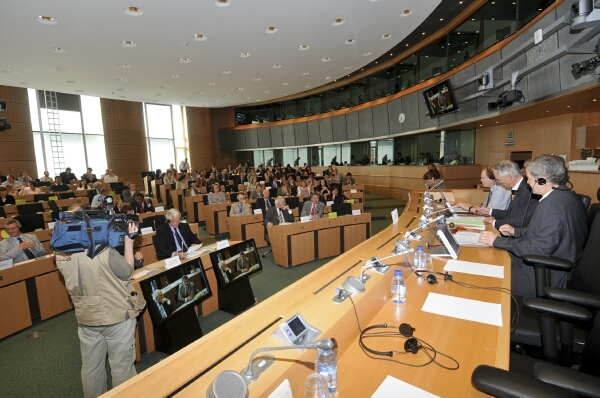 Procedures, therefore, are not the issue, especially from a newspaper which then shows a picture of the Strasbourg plenary (top), with the caption, "Last week, the agriculture committee voted on the Common Agricultural Policy", rather than the Brussels committee room in which the voting actually took place (immediately above). A picture of a different event, at a different time, in a different city, in a different country, for a completely different purpose, just about sums up the Telegraph's approach to reporting. This shoddy propaganda does not serve us well. It is a fair bet that, if the legacy media pollutes the infosphere with alarums on how the sky was going to fall in if we had an in-out referendum, and the lumpen masses were poised to fall upon their babies and eat them, then the next carefully managed opinion poll would discover that an in-out referendum was a "bad thing". And so we are informed in the low-circulation Independent that a ComRes poll has cobbled together a result to please its paymasters. Even then the result does not match the headline. What the poll is testing is the perceived effect of the delay, where some 49 percent of people polled "agree the delay is likely to result in economic harm because of the uncertainty it creates for companies and investors". By contrast, 32 percent disagree with this statement. This is so much fluff, though. What really matters (if only because politicians believe such polls and tend to act on them) is the finding that 30 percent of the public say they are more likely to back the Conservatives as a result of Mr Cameron's referendum promise. 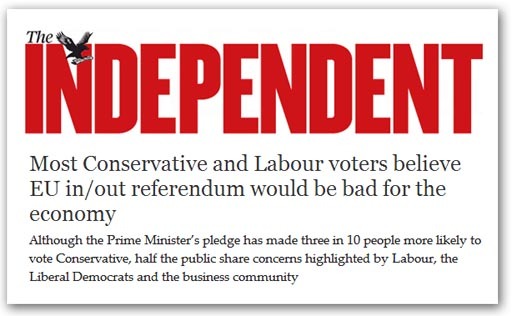 This suggests that Ed Miliband could reap an electoral benefit if he matched the pledge. More than one in four voters (27 percent) would be more likely to vote Labour if the party promised an EU referendum, a finding that "is bound to increase the pressure on Mr Miliband from within his party to offer the public a vote". Here, we see the result matching the findings in the weekend's Survation poll in the Mail, where the Conservatives pick up a couple of points in the wake of the referendum announcement, reversing a downwards trend. But, to add to a growing collection of meaningless polls, we see the received opinion of which "powers" should be clawed back, the top three coming in as immigration, farming subsidies and employment law. 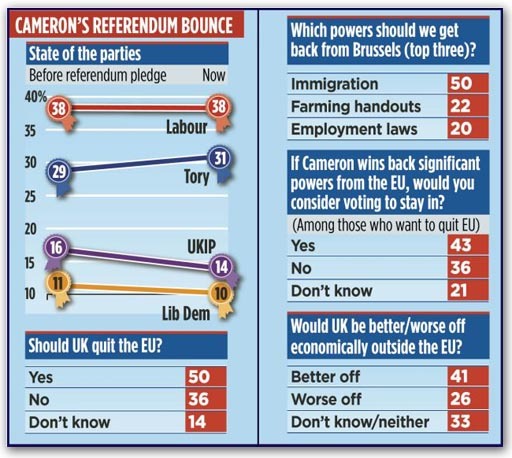 Notwithstanding that this is pure moonshine, we than get 43 percent of respondents wanting to stay in the EU of Mr Cameron wins back powers, with 36 percent wanting to leave and 21 percent "don't knows". By contrast, the straight in-out question gives 50 percent wanting to quit, 36 percent wanting to stay in and 14 percent "don't knows". Just to complete the confusion, though, this poll finds that 41 percent of people believe we would be economically better off outside the EU and 26 percent worse off, topped by a massive 33 percent "don't knows". That latter finding is the only honest answer. Whether we are better or worse off depends very much on the deal negotiated, and then our own efforts after leaving, although it helps to have the belief system in our favour. As a real finding, it is meaningless, the message being that the polls are simply part of the propaganda war. And in that war, we are at least entertained by a poll in France by research agency BVA which shows that a majority (52 percent) of French people favour Britain leaving the EU, while 48 percent want it to stay. With a bit of work and I'm sure we can annoy some more Frenchmen, and get that majority to strengthen. I did a broadcast for Canadian television yesterday on the referendum, telling my interrogator that the EU is a matter of detail. Unless you master that, I said, you will never really understand what is going on. This is a theme I have rehearsed many times, and part of the fascination of the headline subject – the mackerel dispute – is that the detail is almost mind-boggling in its complexity. But what is also fascinating is the way that the so-called "eurosceptic" press has barely touched the issue, leaving it to the "soft left" such as The Guardian, which gets it completely wrong. You would have thought, though, that with Monday's Fisheries Council meeting potentially having a major impact on British interests, the media might have taken an interest. But apart from a piece on the BBC Scotland website, and in The Scotsman, one struggles to find any significant British media interest. Strangely, by far the best report of the day comes from the New York Times. It deals Richard Lochhead, the fisheries minister for Scotland, who has been calling for the appointment of a mediator to help resolve this three year dispute. He is highly critical of the EU, asking: "How can the European Union, acting on behalf of 500 million people, find itself unable or unwilling to take strong action against an overfishing nation, in this case the Faroe Islands, with 50,000 people, or Iceland, with 300,000?" Lochhead, of course, has his Scottish constituency to please, and the importance is illustrated by some statistics. Britain, we are told, has 52 percent of the EU quota and Scotland accounts for 60 percent of that. Ireland is also a major player and is feeling the squeeze. But what is specially interesting about the NYT report is a comment from Sigurgeir Thorgeirsson, the Icelandic government's chief fisheries negotiator. He turns a narrow sectoral dispute into a major example of the inadequacies of the EU, by complaining that European officials appeared unable to grasp that the facts in the water have changed. Iceland gets about nine percent of its gross domestic product from the fishing industry, Mr. Thorgeirsson noted, and the presence of the mackerel in Icelandic waters means other species on which the country depends are being crowded out. It is "a mackerel invasion", says Thorgeirsson. "These fish aren’t tourists. They're not coming to our waters just to look around. They're coming to feed". On the other hand, The Scotsman has Jacob Vestergaard, the Minister of Fisheries of the Faroe Islands. He tells of a situation where, in the last decade, there have been major changes in the distribution not only of mackerel but also herring in the North east Atlantic. The herring biomass has shifted in a south-westerly direction, leading to an increased proportion of fish feeding in Faroese waters during the summer, and for a longer period than previously. These are the issues I touched upon in my second report of yesterday, and these are the most explicit statements yet that I have seen of the effect of the migration, underlying the fact that food supply is under huge pressure from competing stocks. If one stands back from this for a moment, we have a situation where the bulk of the mackerel stock used to be in the waters of EU Member States, and in Norwegian territorial waters. Yet a substantial proportion of the biomass has moved into Faroese and Icelandic waters. What is thus happening is that the EU and Norwegians, with fish having moved out of the waters under their control, are still demanding that they take ninety percent of the permissible catch. They have made no allowance for the fact that the proportion of the biomass in their waters is considerably less than that. By so doing, and by insisting that the Faroese and Icelanders share the remaining ten percent with the Russians, the Norwegians and EU between them are effectively prohibiting Iceland and the Faroe Islands from fishing for mackerel in their own waters, insisting also that they put their own traditional stocks at risk. In typical bully-boy fashion, though, the EU is shrieking about imposing sanctions on the Faroese and Icelanders, accusing them of "overfishing", while Thorgeirsson – quite rightly – points out that European officials appear unable to grasp that the facts in the water had changed. If anything, the EU and the Norwegians are most guilty of overfishing. Clearly, therefore, it is the EU and the Norwegians that have precipitated this crisis. And now, after fifteen rounds of talks, we are still no closer to a solution. 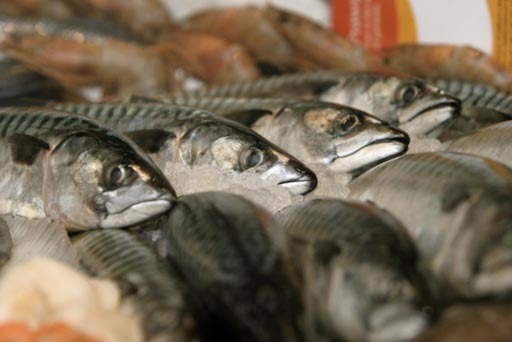 In fact, the problem is nowgetting worse, spreading to a dispute over herring quotas, with Faroe Islands delegation walking away from talks after failing to agree quotas for this stock. Vestergaard, in accordance with the Faroe System, wants the to adapt joint herring management "to better reflect the realities of the fisheries" – which means fishing the herring hard to bring the stock back into balance with the food supply. The EU, in response, sticks to the rigid ICES mantra of maintaining a notional "spawning stock biomass", irrespective of the capability of the fishery to sustain it. As for the original mackerel dispute, EU fisheries commissioner Maria Damanaki is under great pressure to impose sanctions, but reports on the ground suggest that she is not very comfortable with the prospect of launching the procedure. Thus, the EU has done what the EU always does. It has kicked the can down the road to the February Fisheries Council, when it may or may not propose measures. Meanwhile, British ministers are piggies in the middle. Their fishermen suffer if the dispute is not resolved, and the fish processors suffer if sanctions are imposed – all the time with the British not being able to negotiate directly with the Icelanders and the Faroese. It would be almost impossible to invent such a bizarre situation, which is now developing into a perfect example of why we must leave the EU. At least, it would be a perfect example if the legacy media understood enough of what was going on to be able to report it properly. But then, you can't have everything in this world - and especially if we rely on the EU to dictate our fisheries policy. A little while ago, I wrote that we have to confront the prospect that there is an alarming number of people who lack the basic understanding of how the global and regional regulatory system works. We can add to that number Wolfgang Münchau, the doyen's doyen who, today in the Financial Times, adds to the sum of human ignorance by declaring that, "If you are outside the EU, but inside the EEA, you have no vote on single-market policies. Norway and Iceland have to accept whatever the EU decides". That, of course, is not true, not least because of the "veto" or "right of reservation" – set out in Article 102 of the EEA Agreement – to say nothing of being misleading, as both countries have considerable upstream influence that enable them to shape standards before they get to the EU voting stage. Notwithstanding these little gripes, though, Münchau is beginning to ask the right questions, asserting that the benefits of the single market are "vastly exaggerated". They will in the longer term be subsumed by free trade agreements and, in particular, a transatlantic free-trade area incorporating the EU and the United States. This has been something of a hobby-horse of the Financial Times and they are perhaps being more than a little over-optimistic if they believe that the agricultural systems each side of the Atlantic can be harmonised sufficiently to create a level playing field which would permit free trade. With massive understatement, therefore, Münchau casually asserts that "hammering out" a treaty "would not be easy" but he is confident that even if Britain were outside the EU, it would without a doubt be a member of such a zone. Thus, in his book, "there can be no question of it being cut off from trade". 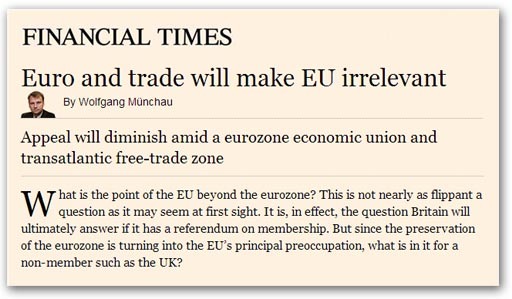 There, Münchau goes a little bit wobbly, as he asserts that, outside he EU, "the UK would still be a member of the European Economic Area". That is not strictly true. It could not happen without the UK joining EFTA and with amendments to the EEA Agreement. Further, he has not caught up with the reality of the relationship of EEA countries with the EU, but there is hope yet. While asserting that there would a "perceived loss of political power", which would be "unacceptable to the UK", he then says: "the argument misjudges the extent to which the UK can negotiate the terms of exit". Article 50, declares Münchau, "makes it possible for countries to depart, but leaves the details to the negotiating parties". Then we get to the "killer point". Faced with the combined development of a eurozone economic union (which we cannot join) and a transatlantic free-trade zone, the added benefit of EU membership loses appeal if most of that benefit can be had outside". Thus we are told: "If one is absolutely certain that one will never join the eurozone, there really is not much of a point to being a member of the EU". Münchau is not quite there yet, but with or without a transatlantic free trade area, we are seeing the convergence of global rules, with – as Booker points out - supra-regional standard-setting which makes the EU increasingly irrelevant. That the doyen of all doyens is nevertheless asking about the relevance of the EU to Britain is good news. Once that question is asked, the politicians will find it increasingly difficult to give an honest answer, and we will be on our way out. Article 50 beckons. From the same wellspring as Mr Cameron telling us that we have to be in the EU to be part of the Single Market, we now have Sir Paul Nurse, president of the Royal Society, telling us that we've got to be in the EU to "win" EU science funding. Notwithstanding the fact that we are net contributors to the EU budget, and could afford to take up the EU-funded programme and still save money, the man is talking out of his posterior. It is not necessary to be in the EU to take part in EU research programmes. Norway has long traditions in participating in EU RTD actions. It first started in 1987 on a programme level. The EEA agreement (from 1.1.1994) gives Norway full rights and obligations in the framework programmes. Norway's participation in EU Framework Programmes has resulted in a research community that is far more engaged than before, both in European research collaboration and as a participant taking responsibility for structuring and internationalising Norwegian research. Additionally, Norway is also part of the European Research Area, and of COST (European Cooperation in the Field of Scientific and Technical Research), and of the European Science Foundation (ESF). A very detailed evaluation of the participation is here, from which we learn that there is a payment made for participation, amounting in 2010 to £142 million, accounting for nearly 80 percent of Norway's £179 million contribution to the EU budget. However, it certainly gets value for money. Norway is also actively involved in policy co-ordination activities outside the framework programme (FP). It has participated as observer in European Research Area Committee (ERAC) meetings, dealing with financial co-ordination outside of the FP and the development of better framework conditions for research in Europe (mobility, careers, intellectual property and so on). ERAC will likely be the platform where the European Commission will discuss its plans for ERA-type regulations and directives and seek sufficient support from the Member States before launching anything. Norway participates in ERA-policy committees such as the Strategic Forum for International Science and Technology Co-operation (SFIC), the High Level Group on Joint Programming (GPC), the European Strategy Forum on Research Infrastructures (ESFRI), the Steering Group on Human Resources and Mobility, the Working Group on Knowledge Transfer and the European Rail Research Advisory Council (ERRAC). In the past five years Norway was also invited to participate in the Informal Ministerial Competitiveness Council. Thus although not an EU Member State Norway has actively taken part in policy co-ordination activities. Given the stability of the EEA agreement its role does not have to be renegotiated with each new Framework Programme. 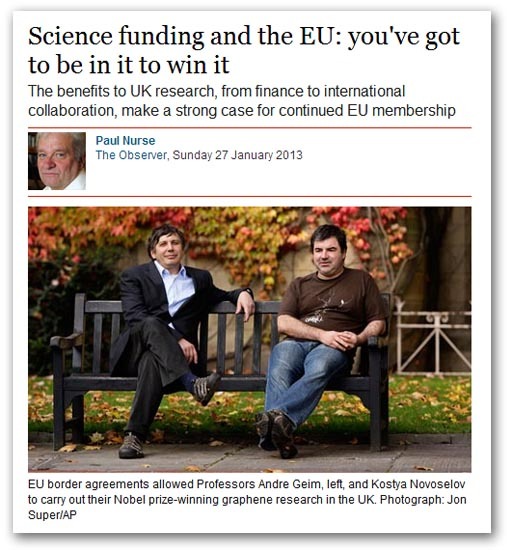 So, it would appear that Sir Paul Nurse, the man who thinks that human activity contributes seven times more CO2 to the atmosphere than derives from natural sources such as the oceans, knows as little about the workings of the EU as he does about climate science – unaware that Norway has been in the EU research programme for over 25 years. But that does not stop the legacy media giving him free access to spread his misinformation and propaganda. In that, at least, we are not surprised. It was ever going to be thus. 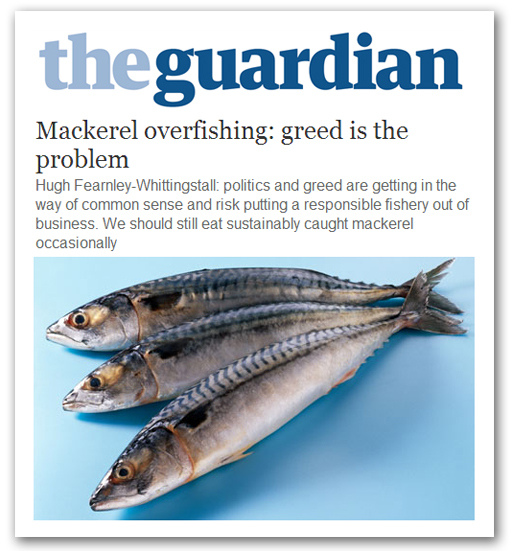 Continuing on from Part I, where we wrote of the complexities of the dispute that has been dubbed the "Mackerel Wars", we find a muddled piece in today's Observer which demonstrates the difficulty in getting to grips with this subject. 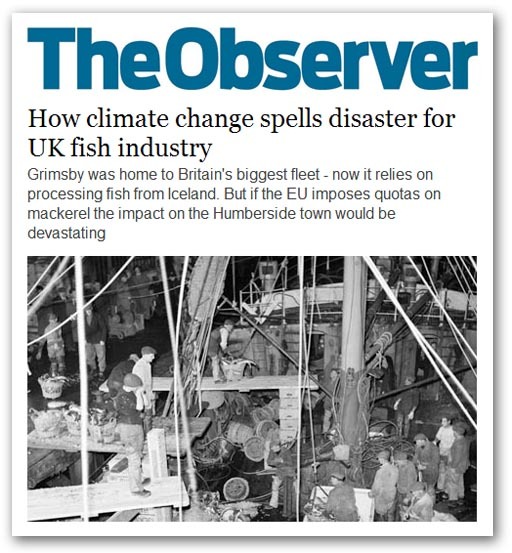 What is marginally helpful, though, is the headline: "How climate change spells disaster for UK fish industry". Forget the bit about the UK fish industry for the moment, and concentrate on "climate change". Referring again to this briefing note, we find that it is a matter of undisputed record that the mackerel biomass has been moving north, a phenomenon attributed to "climate change", triggered by higher water temperatures which have shifted the food supply, with the fish following the food. Prior to 2008, the bulk of the catch was taken from EU Member States water, from Norway and, to a limited extent by the Faroe Islands, with a small amount also taken by the Russian Federation. Things then changed in 2009 when the mackerel started moving is large numbers into Icelandic waters, and the catches there started to become significant. This gave Iceland status as a "Coastal State" within the NEAFC and a seat at the table when it came to negotiating annual quotas. Here, it starts getting seriously complicated for, within the framework of NEAFC, guided by the UNCLOS and FAO agreements, the body of record for setting upper quota limits is ICES, which in turn is reliant on its scientific research with input from member states. At that time, ICES set the mackerel quota, specified in terms of the "recommended total catch" at 572,000 metric tons. This was not enough to sustain the existing fleets in Norwegian and EU Member State waters. Invoking the NEAFC rules, Norway and the EU thus argued that "track record" should determine the apportionment of the quota and since neither Iceland nor the Faroes had a qualifying record, they were not entitled to any quota. The pair then promptly awarded between themselves a quota that amounted to ten percent more than the total catch recommended by ICES. Faced with this, Iceland and the Faroes felt they had no alternative but to award themselves unilateral quotas, allocating themselves 85,000 and 13,000 metric tons respectively, thus triggering the conflict which remains unresolved to this date. At the heart of this, though – and especially as far as the Faroes were concerned, there was a great deal more at stake than just Mackerel catches – a stock which the Faroese were not equipped to exploit. There were two other issues which were to driving the dispute. Firstly, the much more important issue to the Faroes was their traditional herring fishery, and the blue whiting, these valuable fish inhabiting the waters into which the mackerel had moved. And what Faroese scientists were able to show was an alarming situation. Not only did the two species compete for the same food – largely the zooplankton Calanus finmarchicus - but the biomass of fish in their waters has been close to record high, while the zooplankton has been on a declining trend to a record low, and the blue whiting was declining rapidly. This ties in with the second point where there is a major conflict in fisheries management philosophy between the Faroese and ICES in determining allowable fishing effort. ICES work on the basis of calculating the "Spawning stock biomass" and, by a series of species-specific formulae, then calculating a safe level of human predation – which becomes the recommended catch. On the other hand, the Faroese fisheries management system relies on a far more sophisticated range of measures, rather than using quotas as the control instrument. They aim to balance fishing effort in relation to the ecosystem in which it takes place and, in particular, to keep the fish population in balance with the food supply, a philosophy which has gained powerful scientific support. Thus, where there is a deficiency in food supply for a fish stock, be it because of industrial fishing or natural phenomena, the correct way to deal with it is, counter-intuitively, to increase fishing efforts. And, with their increased mackerel quotas, that is precisely what the Faroese – and the Icelanders in their wake – are doing. The response of the EU has been severe. Reports in Augist 2010 were talking of a "mackerel war" and, as the dispute escalated, on 14 December 2011, the European Commission published a proposal permitting "the use of trade and other types of measures as a means to induce a reduction in the intensity of fishing by third countries allowing non-sustainable fishing". Citing UNCLOS and the UN Fish Stocks Agreement, which they claimed had been breached, the Commission proposed to bypass the EFTA/EEA agreement with Iceland, and with sanctions also applying to the Faroes, prohibit the import of fish and fish products from these territories. The final regulations 1026/2012 were published on 14 November 2012, leading to strident calls fromScottish Fishermen for sanctions to be imposed. For 2012, the dispute had escalated out of all proportion, with the Icelanders having set themselves a mackerel quota of 145,000 tons, and the Faroe Islands setting a massive unilateral quota of 148,375 tons – even though they do not have the facilities to process the fish. As the war of words hotted, Scots mackerel fishermen found their own quotas cut and promptly accused Icelanders of "mugging" them of their catches, "plundering" the stocks and putting their £164-million industry at risk. Scottish fishing minister Richard Lochhead said that "the irresponsible overfishing by Iceland and the Faroes" was putting the viability of the Scottish fleet at risk. And this is where the Observer piece comes in. Since Iceland's banking collapse of 2008 and its subsequent attempts to fish its way out of a crisis, Grimsby has boomed on the back of the surge of fresh white fish from Iceland. If sanctions were to be applied, 70 percent of the UK's fish processing industry, along with Europe's biggest concentration of cold storage facilities, would be at risk, alongside 4,000 jobs. The latest development seems to be a statement from Danish fisheries minister Mette Gjerskov, who has said that it is "quite unlikely" that the European fisheries and maritime affairs commission will approve sanctions against Faroes and Iceland. The fact that Norway and the EU have decided to allocate themselves 90 percent of the total recommended mackerel catch for 2013 means there will probably be little legal ground for sanctions to be approved, Gjerskov said. Ironically, aside from the Faroes and Iceland, the biggest potential loser from this ongoing dispute is the United kingdom, with two dogs in the fight. On the one hand, Scottish fishermen are being affected and, on the other, our fishing processors stand to lose a massive part of their income. Yet, the one nation which is not allowed directly into the talks with the parties involved in the United Kingdom. Outside the EU, we could but, in order to preserve that precious "influence" about which Mr Cameron is so keen, we must allow a Greek politician to make the running from Brussels. And that is yet another benefit of our membership of the EU. An illustration of just how complicated international relations can become is emerging in real time, as a long-standing dispute over North-east Atlantic mackerel (NEAM) stocks comes to a head, with British ministers meeting fisheries Commissioner Maria Damanaki tomorrow, prior to the Fisheries Council meeting, which will attempt to resolve the dispute. On the face of it, this is a simple quota dispute between the four main players nations which exploit the stocks, the EU, Norway, the Faroe Islands and Iceland. Historically, the bulk of the quota has been taken by the EU and Norway, but since 2009, Iceland and the Faroes have been demanding a share. As tensions have risen, relations between the parties have broken down with the Faroese being accused of acting like "pirates", Iceland of "greed" and the EU of bullying tactics, while there is talk of a new fish war and trade sanctions. … if the countries involved could only agree sensible catch limits this could still be a certified sustainable fishery. The issue could be resolved at a stroke, and we could all go back to eating mackerel again with a clear conscience. While Fearnley-Whittingstall wants to put the problems down to "politics and greed", which "are getting in the way of common sense", we have here a fiercely complex issue, on four different levels – politics, commerce, science and the environment itself – all of which are intermixed. If the magic wand of "common sense" could be waved, that would have been done years ago. As it is, the grown-ups are having to sort it out, not least our very own Defra Secretary Owen Paterson – fortunately, a man with some some experience in fisheries policy. On the political level alone, the situation is extraordinarily complicated, as we are dealing with an amalgam of national interests, the regional bodies of the EU and EFTA/EEA, and a skein of international treaties and agreements and in this first part, we will look at the political structures which create the framework in which discussions are being undertaken. At the very top of the heap is not the EU's Common Fisheries Policy (CFP), which some think is the driving force, but the UN Convention on the Law of the Sea (UNCLOS). But, because NEAM are a migratory and "straddling stock" – the biomass spread over the territorial waters of different states – there is an extensive web of additional agreements. The key treaty here is the Convention on the Law of the Sea of 10 December 1982 relating to theConservation and Management of Straddling Fish Stocks and Highly Migratory Fish Stocks, and the 1995 implementing agreement known as the United Nations Fish Stocks Agreement (UNFSA). But this is also augmented by the Food and Agriculture Organisation (FAO) Code of Conduct for Responsible Fisheries, adopted in October 1995. This is a voluntary agreement, although certain parts are based on UNCLOS provisions and some parts have been given binding effect by means of other obligatory legal instruments, such as the Agreement to Promote Compliance with International Conservation and Management Measures by Fishing Vessels on the High Seas, 1993. There is also the FAO International Plan of Action for the Management of Fishing Capacity, which came into force progressively, to be fully effective by 2005. Scientific issues relating to human activities affecting, and affected by, marine ecosystems, and in particular fish stocks, are handled by the International Council for the Exploration of the Sea (ICES). As regards the European Union, the EU ratified the UNLOS agreement in 1998, and subscribes to the FAO codes, the combination being part of the external dimension of the Common Fisheries Policy, set out in detail here. Although the CFP is not part of the internal market acquis and is not part of the EEA Agreement, trade in fish and fish products is covered, and to some extent is affected by these international treaties and agreements. Norway, of course, represents herself on the relevant bodies, but EU Member States are represented by the European Commission and the EEAS, which also deals withUNCLOS issues. This is then further complicated by the fact that the EU has concluded or is party to multiple bilateral and multilateral treaties with neighbouring fishing states. For instance, it lists eleven with Norway, of which three are bilateral, eight with Iceland, and one with the Faroes. Now, because we are dealing with straddling and highly migratory fish stocks fish, the United Nations Fish Stocks Agreement (UNFSA) kicks in and, as this briefing note helpfully explains, the stocks have to be managed by a Regional Fisheries Management Organisation (RFMO), which consists of Coastal States and relevant Distant Water Fishing Nations (other nations with a real interest in the fishery). In this instance, the relevant RFMO is the North East Atlantic Fisheries Commission (NEAFC), to which the Russian Federation, Norway, Iceland, Denmark (in respect of the Faroe Islands and Greenland) and the European Union are parties. The UK was originally a member but in 2006 the founding Convention was modified and EU Member States as individual members were withdrawn. They are now represented exclusively by the European Commission. Thus far, and we have only set the scene. We have four nominal parties to this dispute, Norway, Iceland, the Faroe Islands (formally represented by Denmark, an EU member), and the EU representing the UK and others which have a major interest in the issue. Crucially, in the UK, it is mainly the Scottish pelagic fleet that has the key interest here, but the UK does not have a seat at the NEAFC table, and cannot deal with the parties direct. And that is why ministers are going to Brussels instead of Oslo, talking to EU Fisheries Commissioner, Maria Damanaki, a Greek leftie politicians, born in Crete, and hugely unpopular even in her own PASOK party. This is not a place where "common sense" will find a comfortable home, and to dismiss the issue as "greed" doesn't even get near. EU politics: don't go to Brighton! 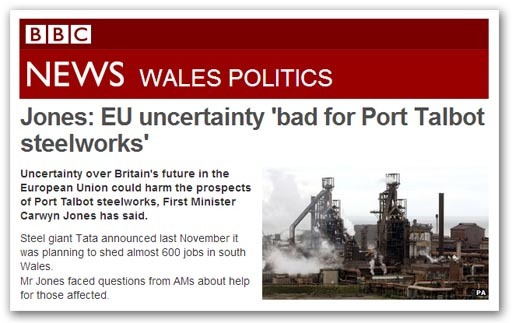 UK politics: "Europe" good for Cameron? EU politics: we should listen to these? EU politics: decoupling from "little Europe"
EU Referendum: it may never happen? 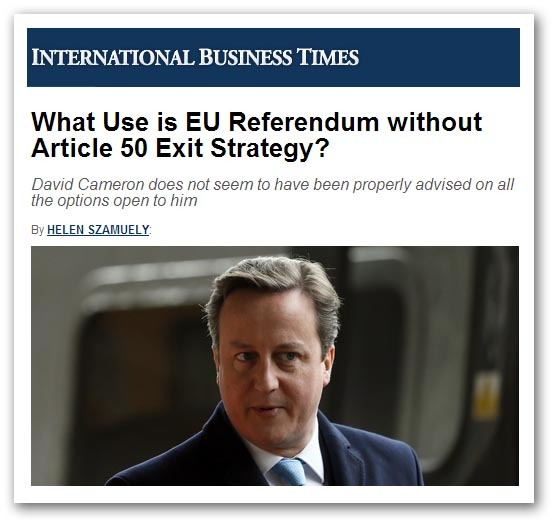 EU politics: the trouble with "Europe"
EU politics: Cameron's strategy in tatters? EU politics: jobs from Europe? EU politics: doubleDutch or doublespeak? EU politics: EU supporter supports EU – shock! Climate change: a surfeit of warming?